​Who doesn’t love Chicken Pot Pie? Creamy, hearty chicken soup wrapped up in a warm flaky crust…it sounds dreamy, but it’s actually a nutritional nightmare! Not only are there far too many carbs and calories in the crust, but the soup itself is often filled with heavy dairy products and noodles that make weight gain automatic. I have a lightened up this recipe for Chicken Pot Pie Soup that gives you the same flavors and comfort of Chicken Pot Pie, while keeping you on track with your fitness and fat loss goals. 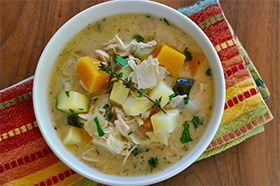 Enjoy this warming recipe on chilly day! Stir in the coconut flour and cook for 2 minutes. Stir in the wine and cook until evaporated. Stir in the broth, butternut squash, thyme, poultry seasoning and bay leaf. Bring the soup to a boil over medium-high heat and then reduce to medium. Simmer the soup until the butternut squash and sweet potatoes are tender, 10-15 minutes. Discard the thyme and bay leaf. One serving equals: 227 calories, 15g fat, 11g carbohydrate ,4g sugar, 329mg sodium, 3g fiber, and 12g protein.